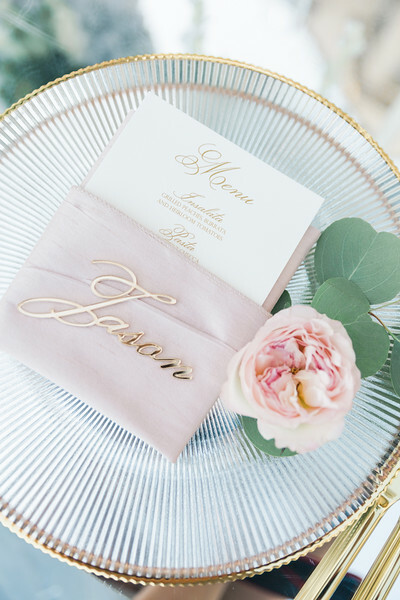 This intimate pink wedding in Beverly Hills may have been small on guest count, but it was big in love, glamour, and romance! It's always a pleasure to team up with Loriann from Wife of the Party and we're so excited to share these gorgeous pictures with you all! The ceremony took place on the lawn of the mansion and featured a short aisle of ombre petals leading up to two crescent pink and white arrangements. 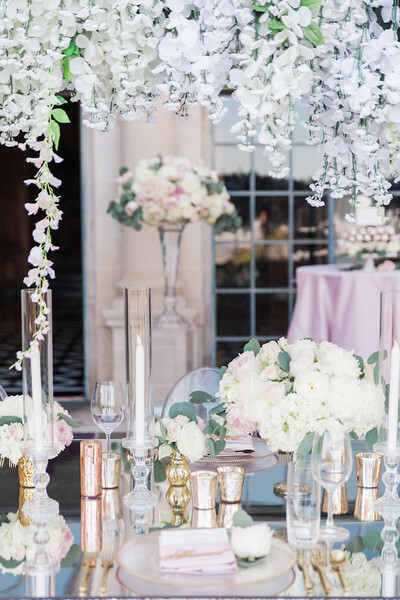 They flanked the aisle and sat atop reflection vases and acrylic columns. Guests sat on modern ghost chairs as the couple said their vows on a beautiful summer day in Southern California. This bouquet was so stunning- lush and romantic peonies and roses were met with cascading silver dollar eucalyptus and stems of lemon leaf. And we can't go without mentioning this delicious dessert display. 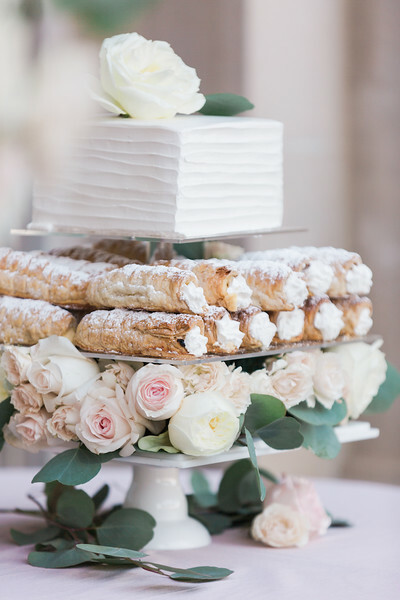 Filled with gorgeous blooms (and those cannolis- come on!!! ), this sweet cake was one of the highlights of the evening. 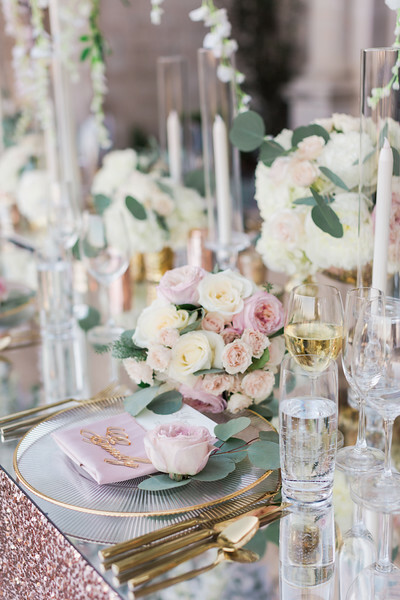 The beautiful reception consisted of one long dining table with a pink sequined linen and mirrored tabletop. Dozens of ivory taper candles danced down the table with petite florals and mercury tea lights. 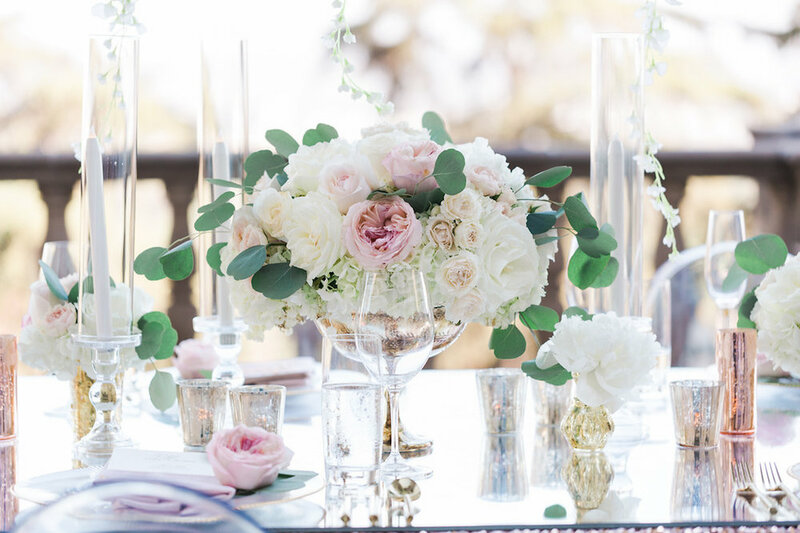 Gold accented stemware complemented the glass chargers with petite floral blooms and eucalyptus stems. Above the guests was a custom structure adorned with hundreds of stems of wisteria, eucalyptus, and other greenery. Cheers to another beautiful wedding executed in partnership with Loriann Serna, one of our favorite coordinators!